MyMovieMonsters.com > Scary Monsters Magazine > Scary Monsters 1-100 > Scary Monsters magazine #72 - Curse of the Werewolf tribute! ALMOST GONE! 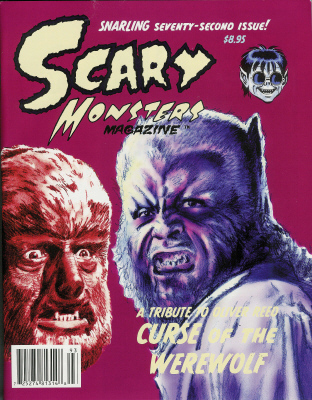 The SNARLING Seventy-Second issue of Scary Monsters is here, featuring a tribute to Oliver Reed and Curse of the Werewolf! This issue is nearly a sell out! M.T. Graves Digs Monster Bash 2009! Color cover with 138 B&W pulp pages inside. Printed September 2009. See our ad on page 127. All other ads, contact information and website addresses related directly to Scary Monsters Magazine appearing in this magazine are no longer in effect. Please direct all inquiries to scarymonsters@mymoviemonsters.com.